Always follow your passions. 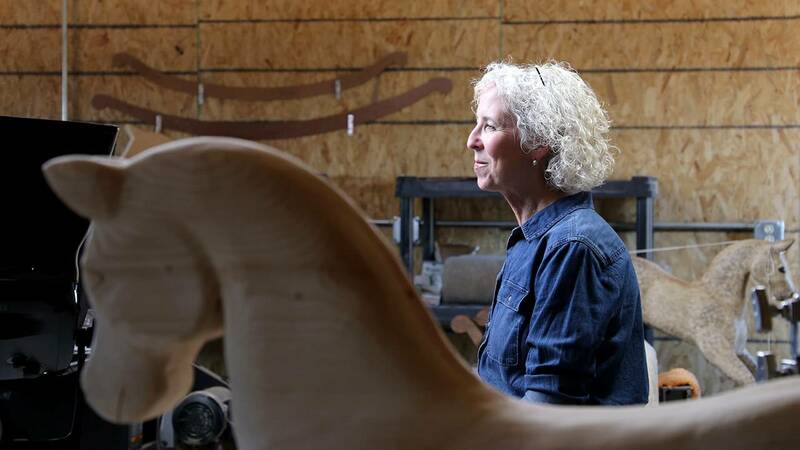 Jackie Wilson of Oklahoma followed her passion for horses, drawing, and woodworking; years later she crafted a stunning horse commissioned by the Obamas as a gift to Prince George. Watch A Craftsman's Legacy Sunday, October 15 at 6:30 am on OETA. Here are some thoughts from Jackie about her work. Q: If you had 24 free hours and a fully stocked, state-of-the-art shop what would you work on and why? A: I would probably come up with a new design for another rocking horse, maybe a new size with more detail. Q: Many people are jealous of craftspeople because you have a job that you derive a lot of meaning from. When you’re not working, what do you do for fun or to relax? A: To relax at home—I love to read. I have a whole library of books to delve into. Q: There are probably a lot of people reading this who have always wanted to work with their hands, but may be afraid or too busy to try. What would you say to them? A: There is such an adventure out there for people to try new things. It is rewarding to just try. Start small so you don't get bogged down and feel like a failure. Just trying something new is a success in itself. If it doesn't work out like you would like it to, so what? You can try again. There is no one looking over your shoulder to criticize your work. You can make as many mistakes as you like. I sometimes feel like I have made every mistake in the book and then, lo and behold I make a new one. So what? Life isn't about being perfect. It's about having fun trying. Q: You’re being featured on A Craftsman’s Legacy because you’re very talented and good at what you do. Our viewers may not understand that you’ve been doing this for a long time and you’ve worked hard to become good at your trade. What’s the longest you’ve worked on one piece? What was the project? A: I made a horse for a children's museum that was large pony size - much larger than any other horse I had ever made. It took a little over 4 months from the planning stage to finish. Q: Our viewers usually only see the finished project and your successes. In most cases, craftspeople learn a lot from failure as well as their success. Would you mind sharing one of your most epic failures? Or a maybe a project that was a good idea but didn’t materialize as anticipated? A: I came to the finish of a rocking horse and the finish was bad. I am talking about the stain and varnish. It was unusable for the customer I was making it for and had to make another one to replace it. Q: Do you have a certain tool that you can’t live without? Do you have a secret weapon? A: I used to hand chisel my horses before I started having to make a lot. The tool that changed that is an angle grinder with a particular head that looks like a doughnut cut in half lengthwise. It reduced the time required to shape the horse body and head amazingly.